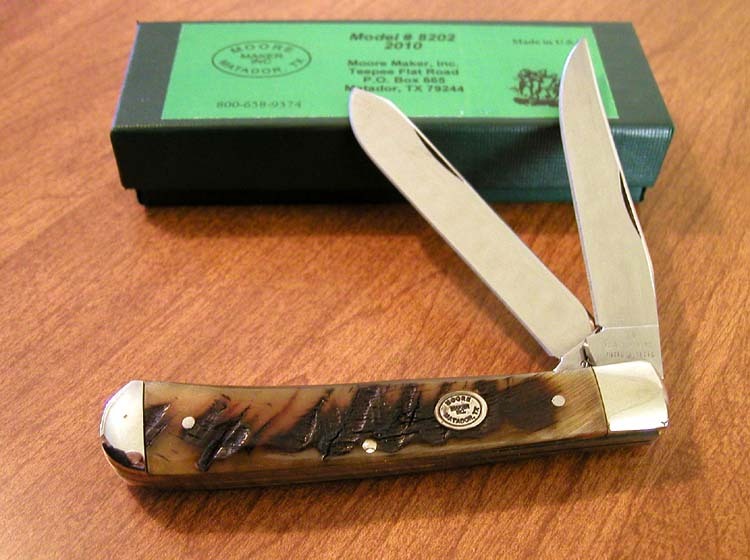 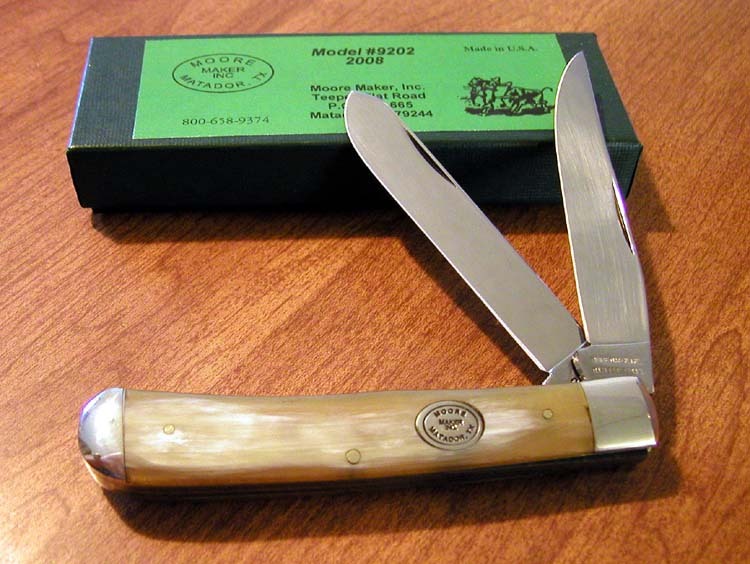 MM-5206LLBJB BLACK JIGGED BONE HANDLE 2 BLADE JUMBO TRAPPER, 4 1/2" CLOSED. 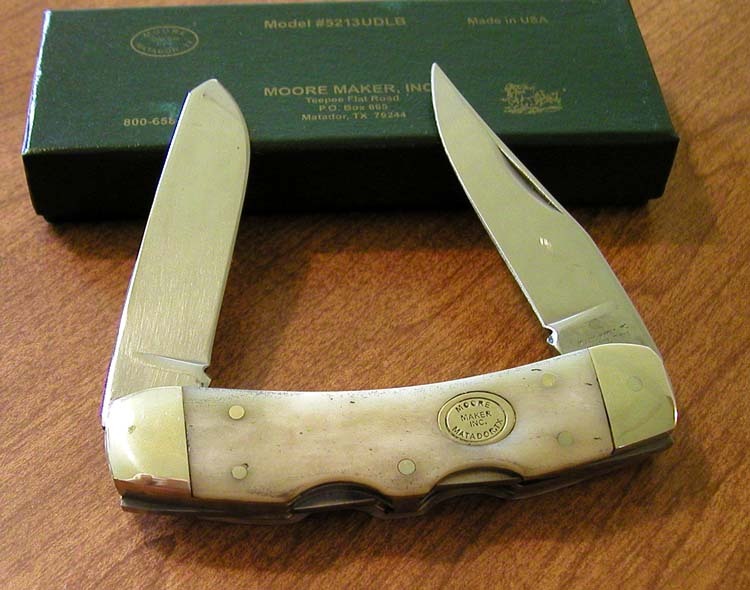 MOORE MAKER SHIELD. 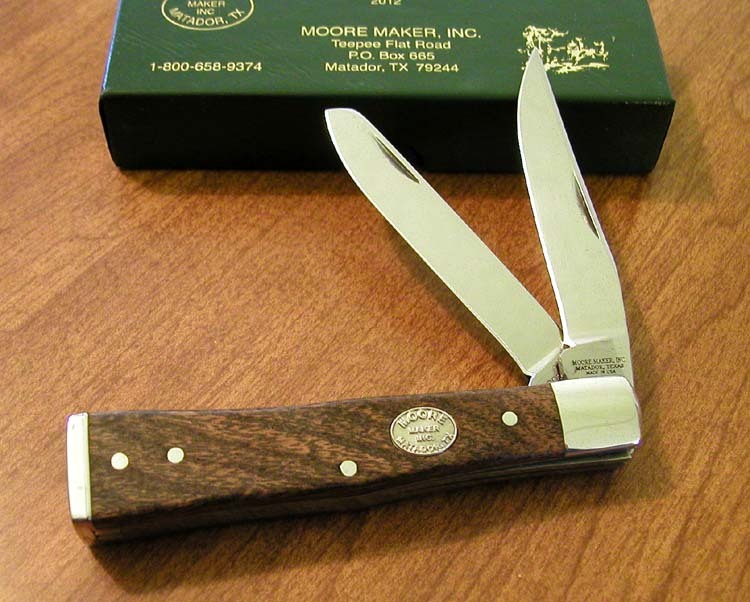 CARBON STEEL DROP POINT AND SPEY BLADES. 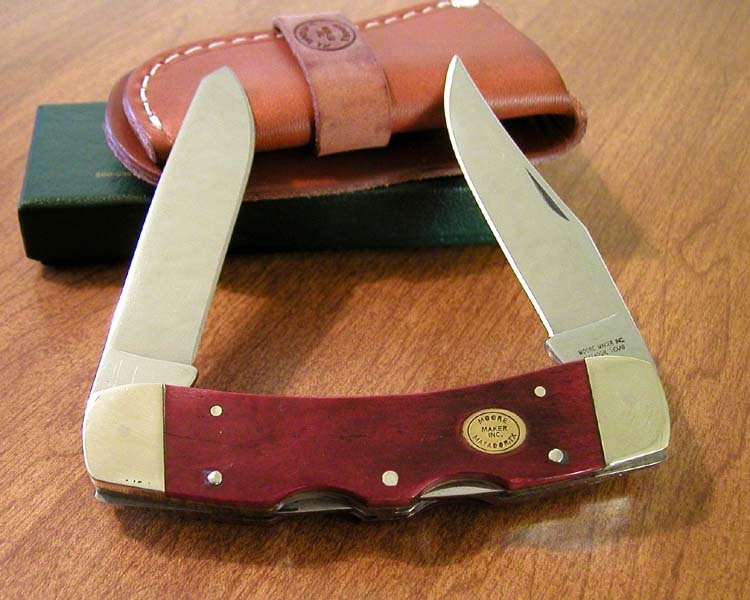 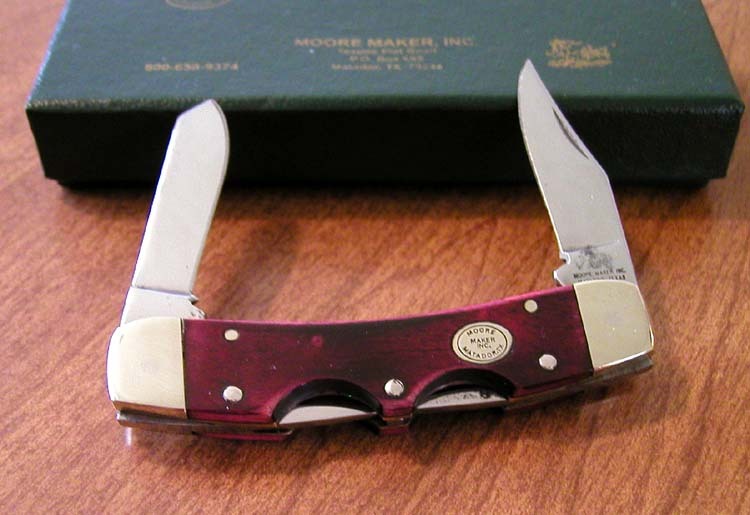 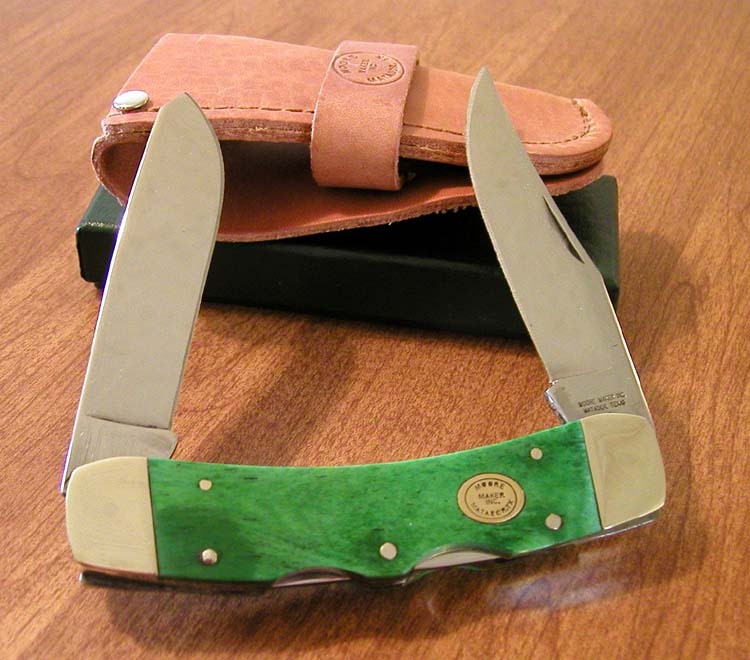 THE DROP POINT BLADE LOCKS. 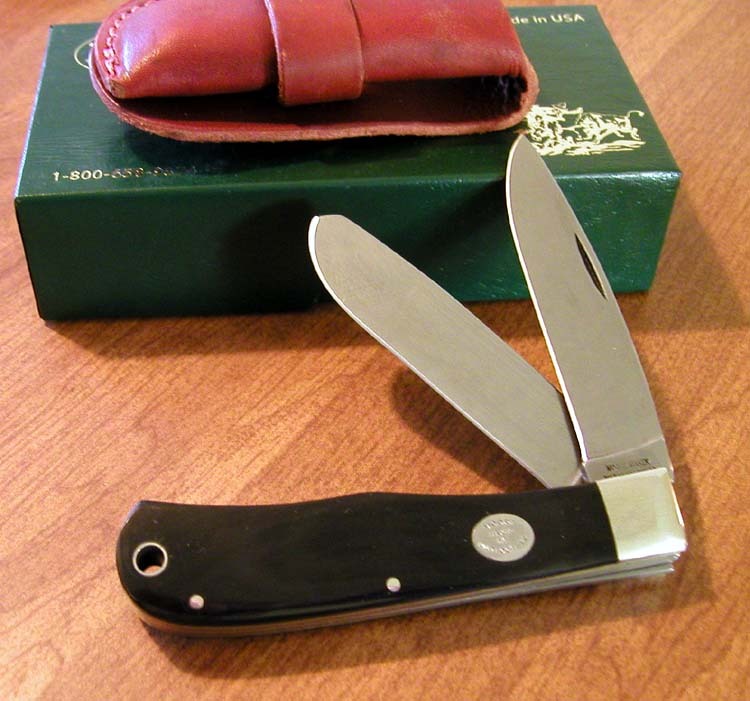 LEATHER SHEATH. 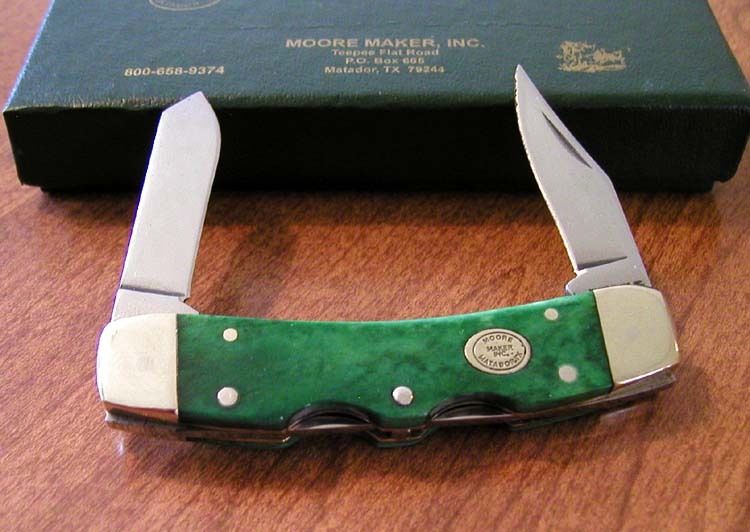 $121.00 SOLD OUT! 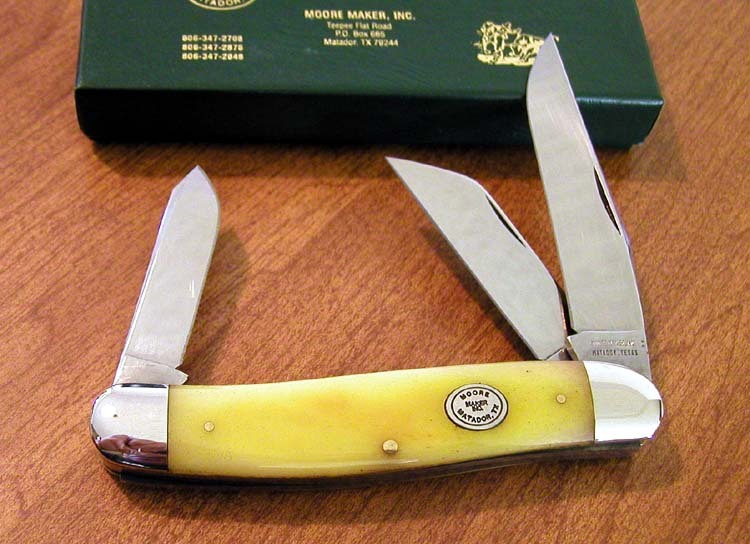 MM-5304YJB YELLOW JIGGED BONE HANDLE 3 BLADE LARGE STOCKMAN, 4 3/8" CLOSED. 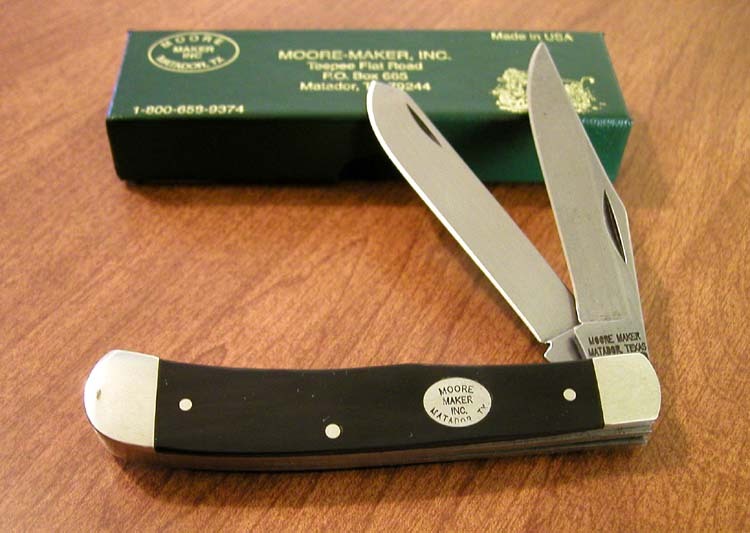 MOORE MAKER SHIELD. 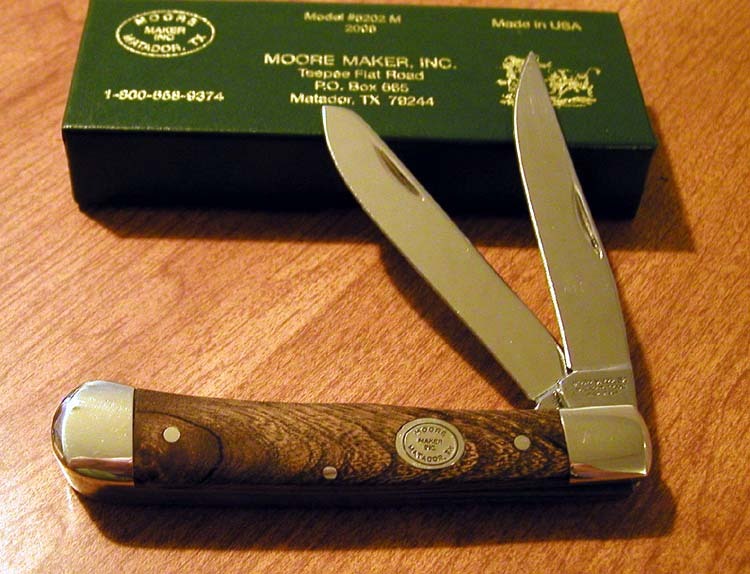 CARBON STEEL CLIP, SPEY, AND SHEEPSFOOT BLADES. 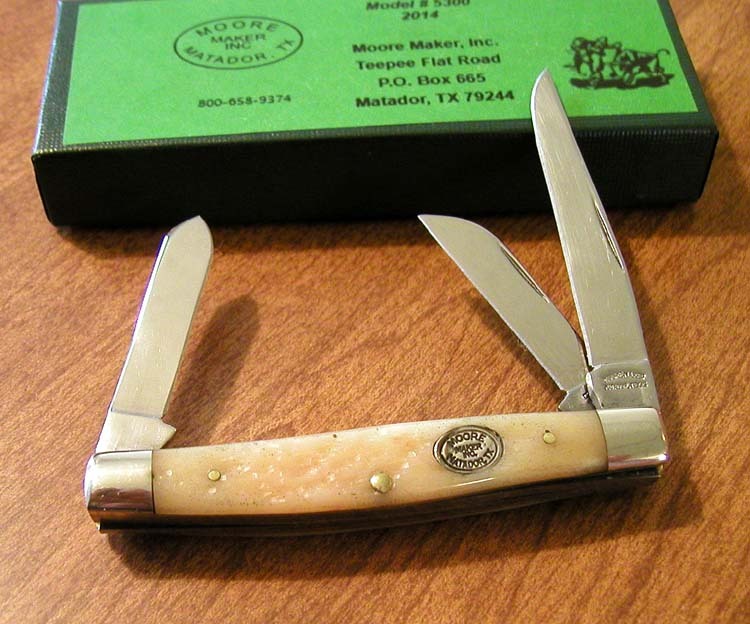 $102.00 SOLD OUT! 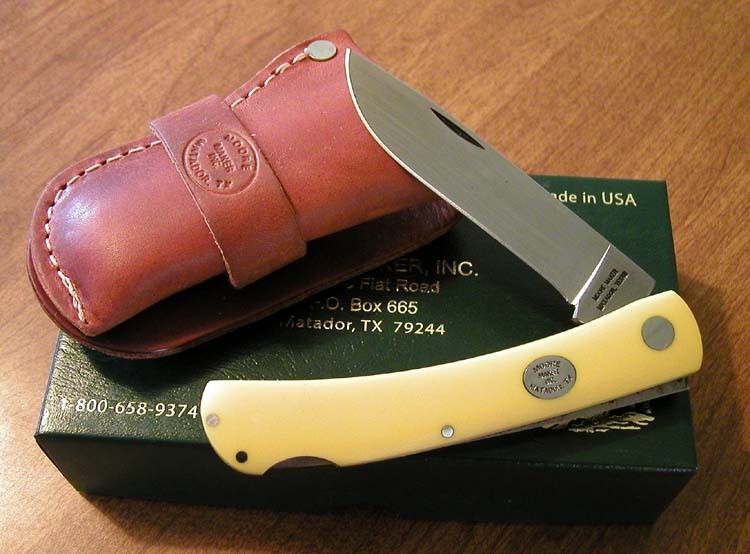 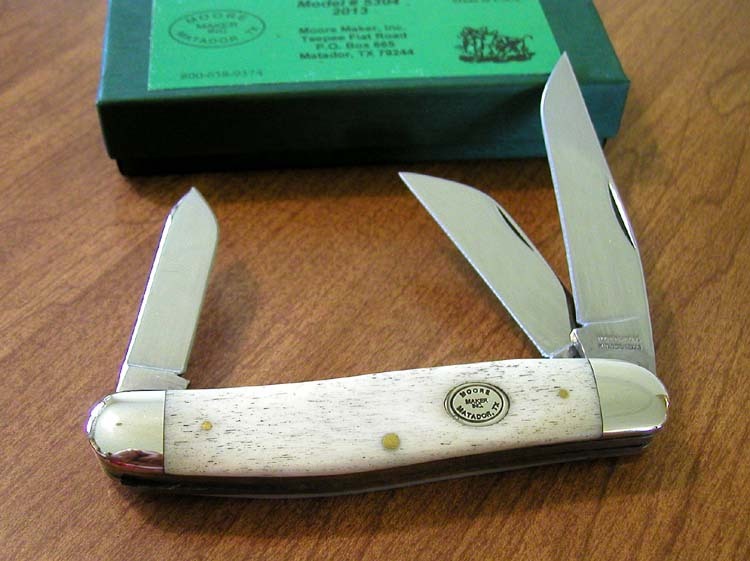 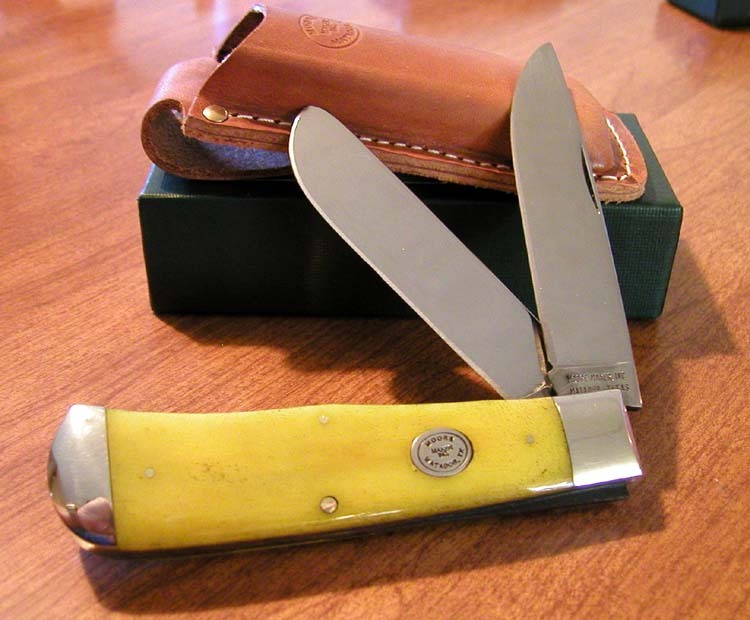 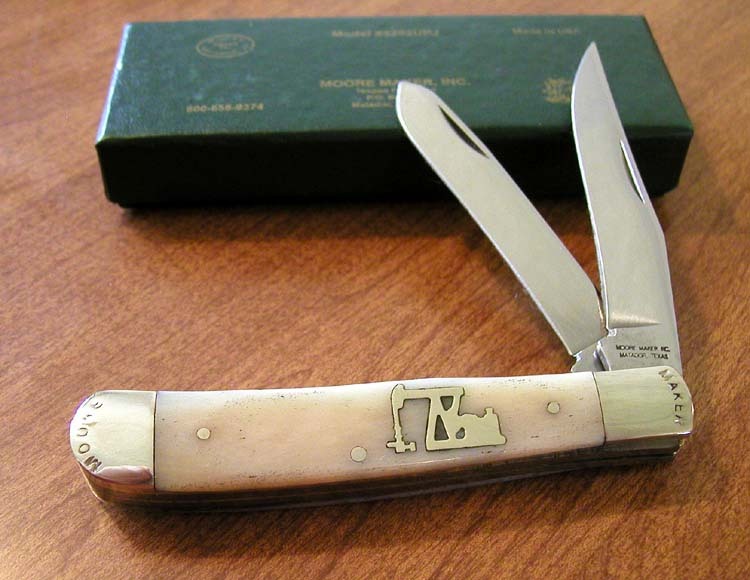 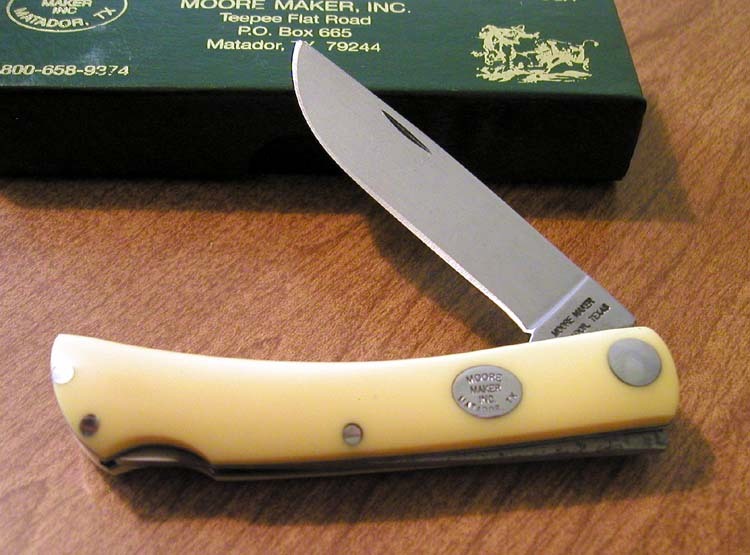 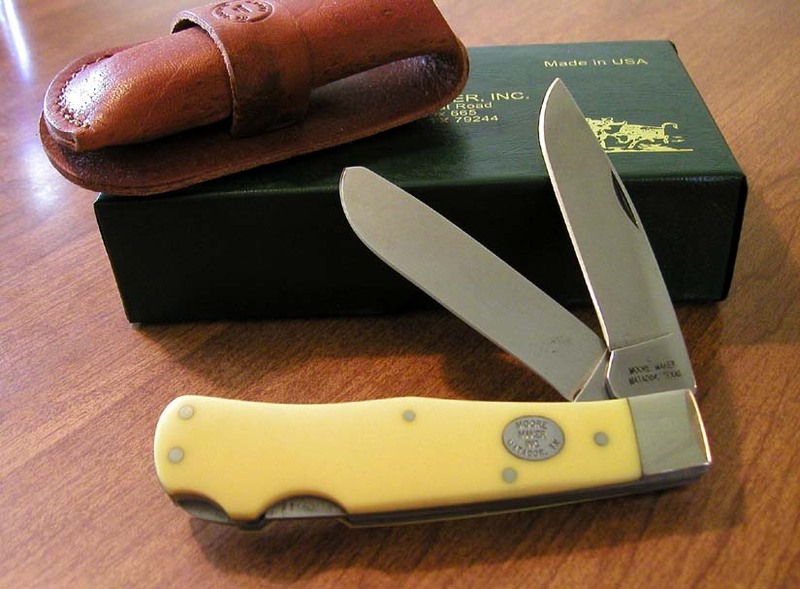 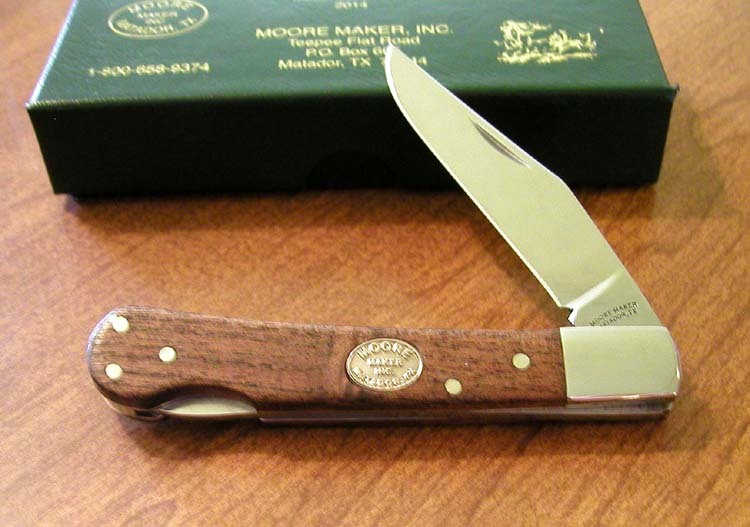 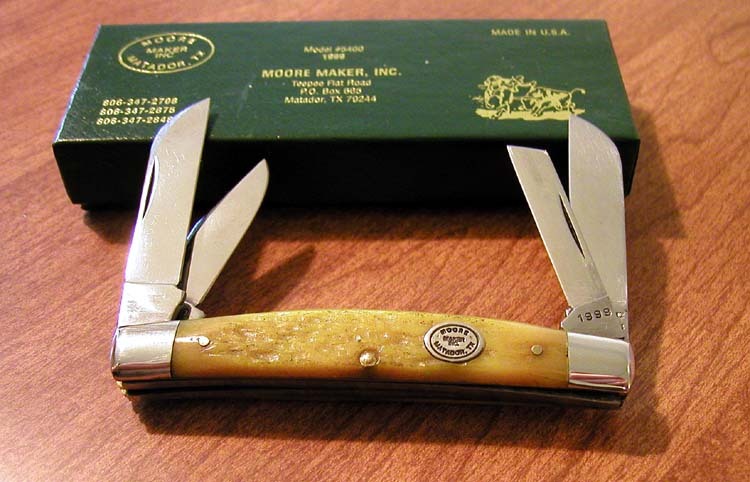 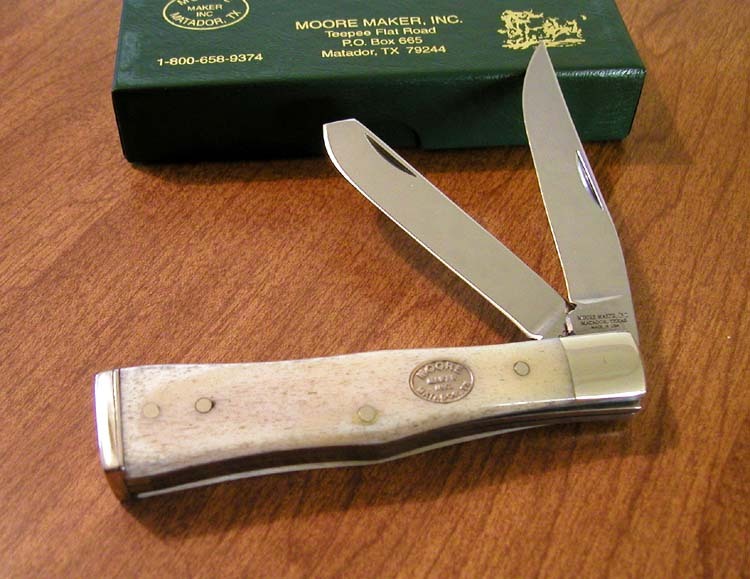 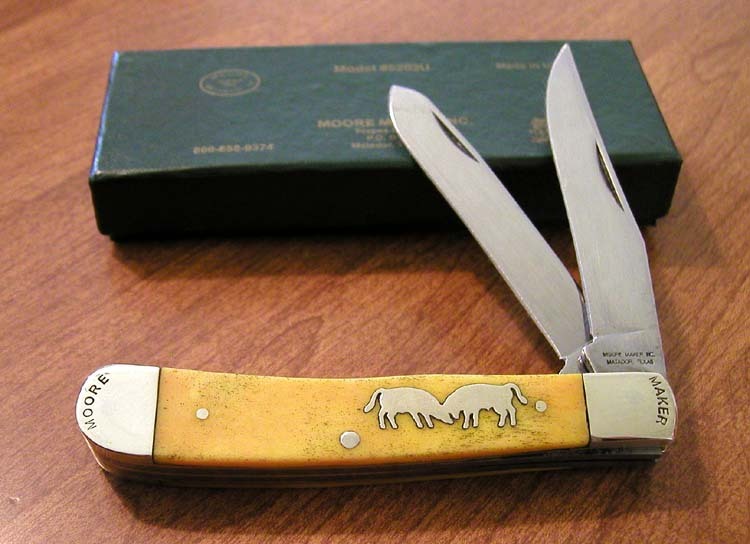 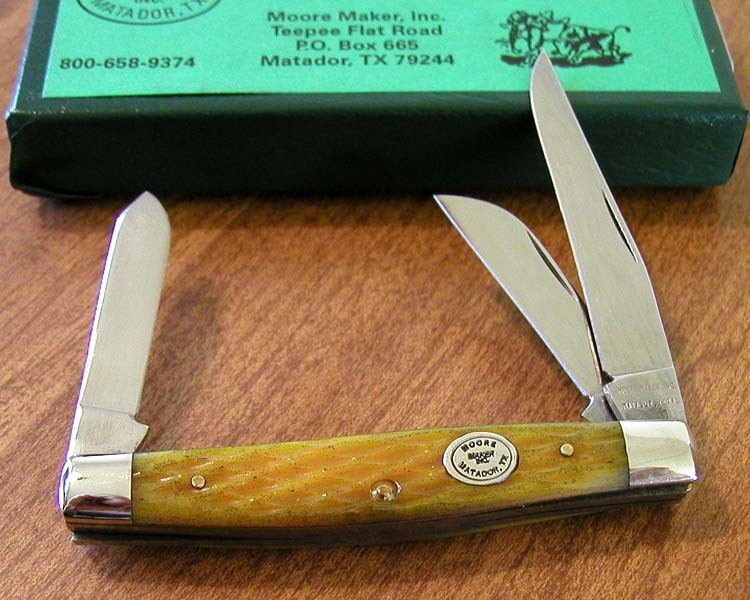 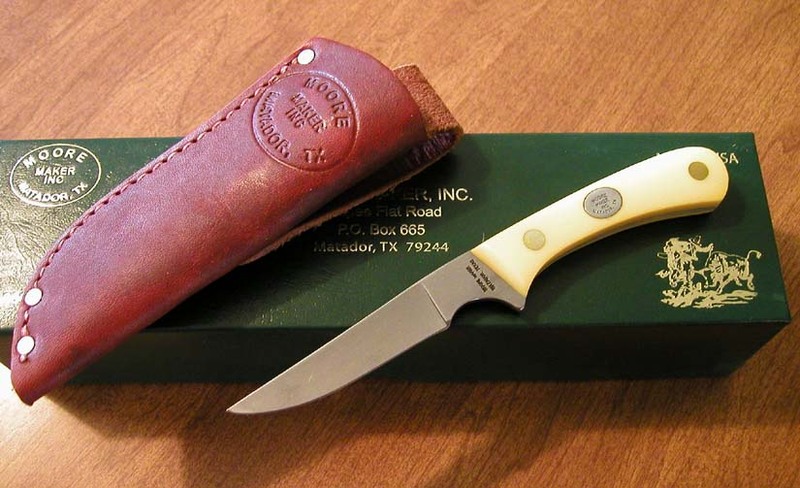 MM-5304YSB YELLOW SMOOTH BONE HANDLE 3 BLADE LARGE STOCKMAN, 4 3/8" CLOSED. 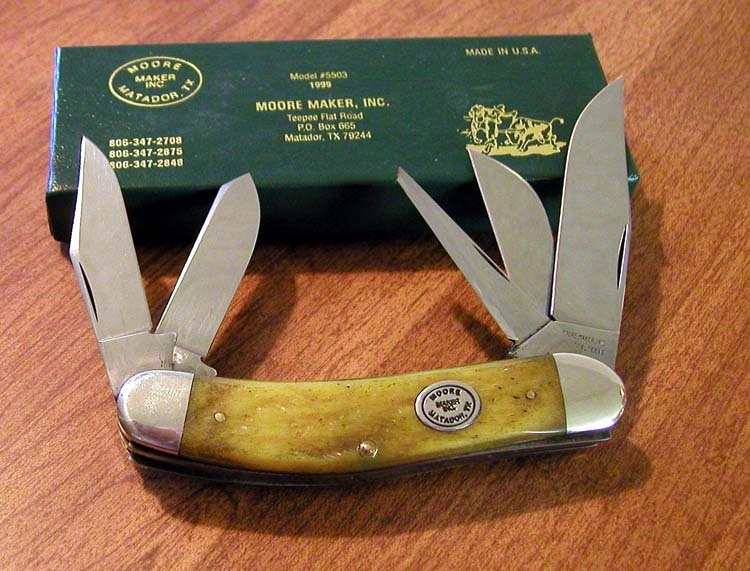 MOORE MAKER SHIELD. 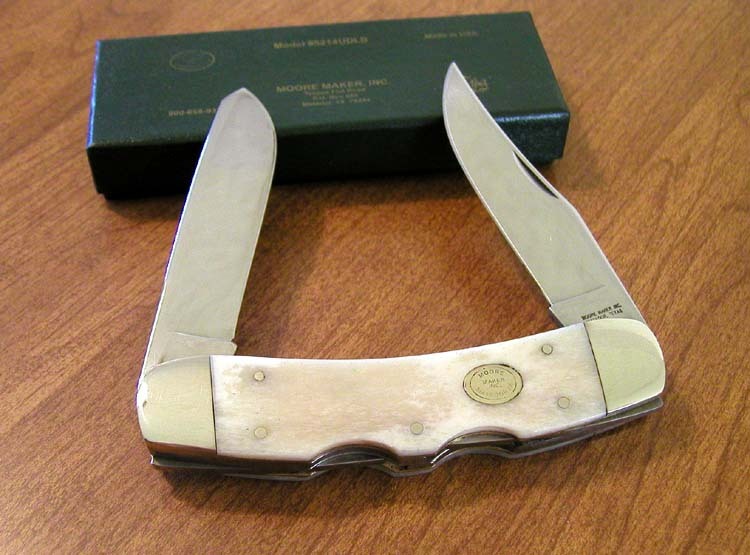 CARBON STEEL CLIP, SPEY, AND SHEEPSFOOT BLADES. 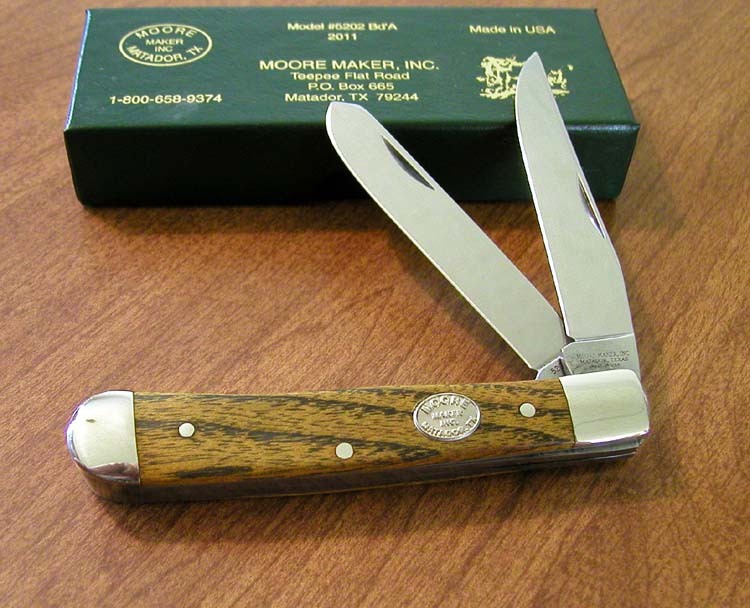 $102.00 SOLD OUT!